These indicators are displayed in this order: power / temp / volt / OV. A value of 1 means there is a limitation, a value of 0 means there is no limitation. 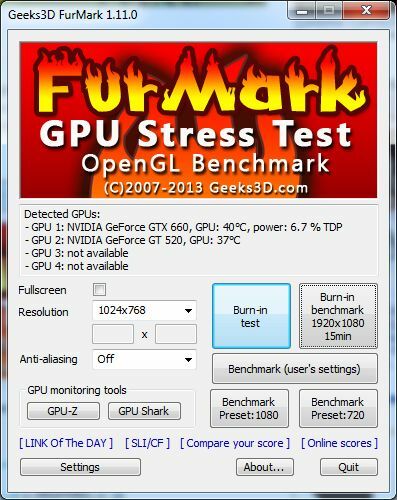 FurMark 1.11.0 comes with the support of latest GeForce GTX 700 (GTX 780, GTX 770 and GTX 760) and AMD Radeon HD 7990 and GPU monitoring tools have been updated to their latest versions (GPU Shark 0.7.3 and GPU-Z 0.7.2). added the display of NVIDIA GPU Boost limiting policies for GTX 600 / GTX 700.
updated multi-gpu information (NVIDIA SLI and AMD CrossFire) in the main GUI and in the 3D window. 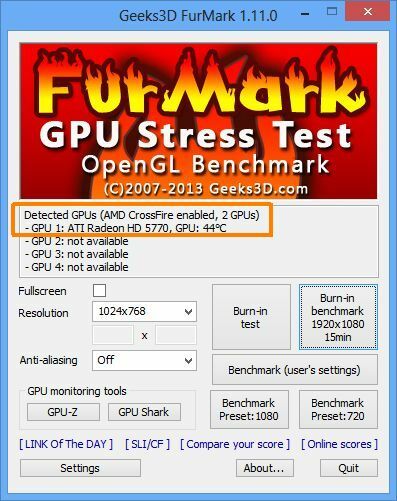 added support of GeForce GTX 700 Series (GTX 780, GTX 770 and GTX 760) as well as Radeon HD 7990.
updated with GPU Shark 0.7.3 and GPU-Z 0.7.2.
update: ZoomGPU 1.8.18 (GPU monitoring library). When will have portable + multi language + Mac/Linux/… version ? 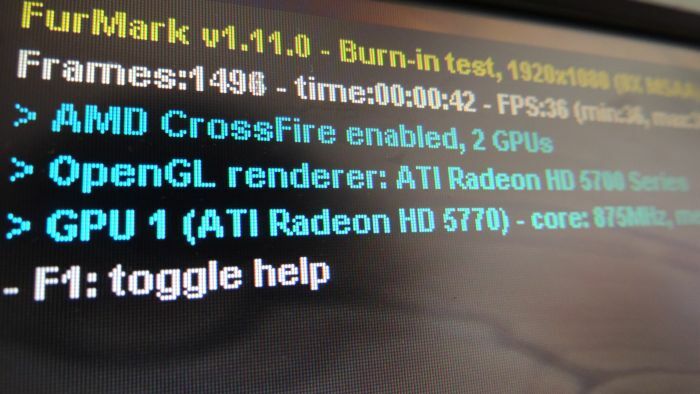 Great program.Ihave some problems while I play games,screen goes black and than error appears floating around screen saying “Hz ?”.So I decide to try with FurMark and same thing is happend.Im also notice that my GPU fan dont work so that is probably the problem. It ran flawlessly with no crashing. I’m stumped. Well here is my result from running it. I have no idea what it means. I am currently running FurMark 1.10.3 on Rhel 6.1. My system has a GT650M (EK107). 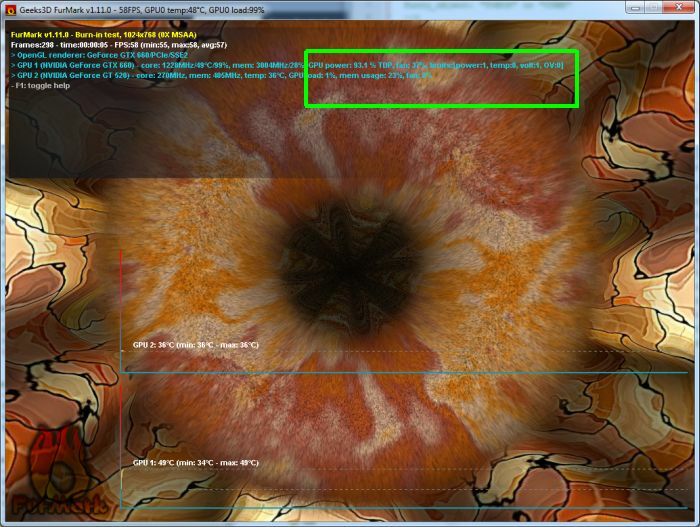 I have four 1920 x 1200 displays connected and configured in the NVIDIA control panel as TWIN View. 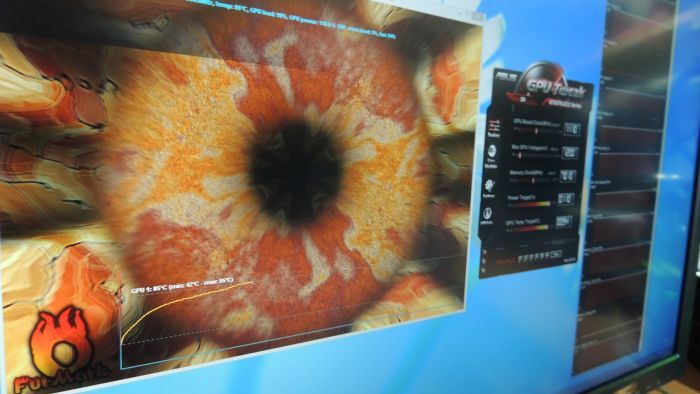 I am essentially running an extended desktop of 7680 x 1200. I have selected the default image size of 7680 x 4800 within FurMark control panel. I can only get the corresponding FurMark dynamically rendered image on 3 of the 4 displays. Any suggestions to enable me to get FurMark to execute on all 4 displays? I cant make it start. Windows is searching the web for a solution and nothing. I have tried anything i can to start the programm but i cant. Any suggestions?